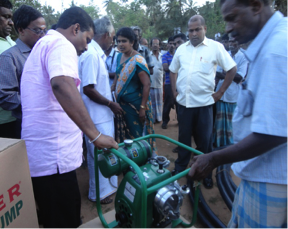 Sarvodaya Rural Technical Services (SRTS) is the Technological Empowerment Arm of the Sarvodaya Shramadana Movement. SRTS was formed in 1978 after an agreement between Sarvodaya and Helvetas – Swiss – Association for International Co-operation – was reached under which Helvetas assured Funds, Technological Expertise etc. for the implementation of infrastructural development activities in the villages. The function of SRTS is to service a quarter of Sri Lanka’s population that lack access to clean water and basic infrastructure and aids villages by mobilizing the community to implement much needed Housing Schemes, Water and Sanitation Projects and Alternative Energy options. By encouraging the use of sustainable technology, the SRTS helps communities achieve sustainability and development. Request for assistance is made by the Sarvodaya Shramadana Society (SSS) to the respective Divisional Coordinator (DC). Selection of projects to be included under each district on a prioritized basis depends on the availability of funds allocated to the respective district and the approval of SEEDS in accordance with the SEEDS Loan Scheme. Beneficiary / Community participation is emphasized, as it is essential in every stage of a project for the success of the development effort. Community contribution is around 30% of the direct expenses. It may come through materials available in the area, labour, etc. Implementation of Infrastructure Development Activities through construction of 415 GWS – Schemes 5297 Wells, 13743 Latrines, 358 Houses & 190 Culverts. Technical Evaluation Report of 1996 revealed that 66% of GWS Projects implemented by SRTS are in good working condition. Involvement in the Publication of Technical Manuals for GWSS, Wells, Latrines, Hand Pumps and caretakers thereby contributing to establish Quality Standards in the RWSS sector. Functioning as Training Institute in Rural Water and Sanitation for Community Water Supply & Sanitation Project implemented by the Sri Lankan Government under World Bank Funds. Experiences with HSL in the publication of Comprehensive Manuals in GWSS, Wells and Latrines. Consultancy Services to Third Parties in Designing and Planning Water Supply Projects in Sri Lanka. 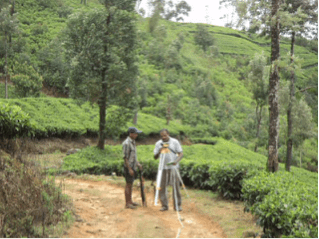 Involvement in Water Vision 2000 – Process in Sri Lanka. Participation at Asia Regional – Consultation on Improvng Sustainability of Rural Water Supply and Sanitation Programmes.